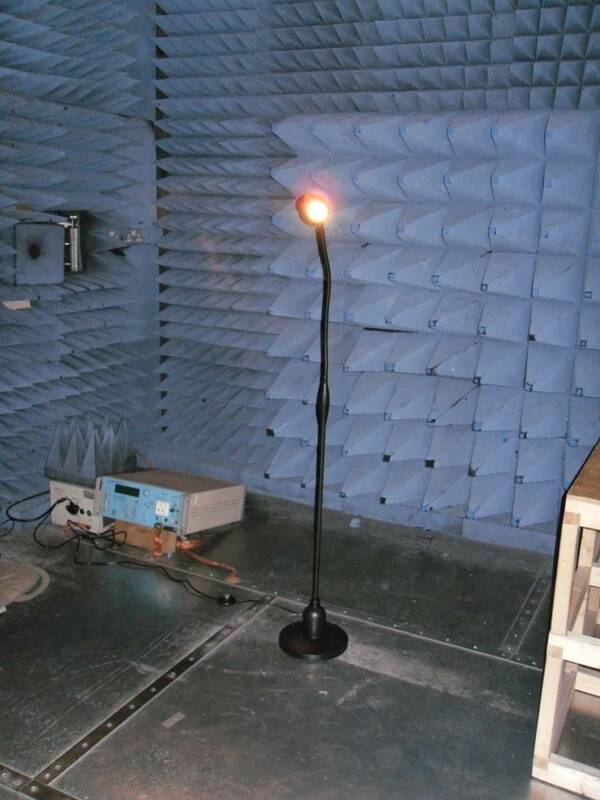 In July of 2010, Peter and Sharon Metcalfe, of the "EMC and LVD testing, training and consultancy" company, METECC, came across a lamp that seemed to advertise its complete lack of compliance with the EMC Directive. 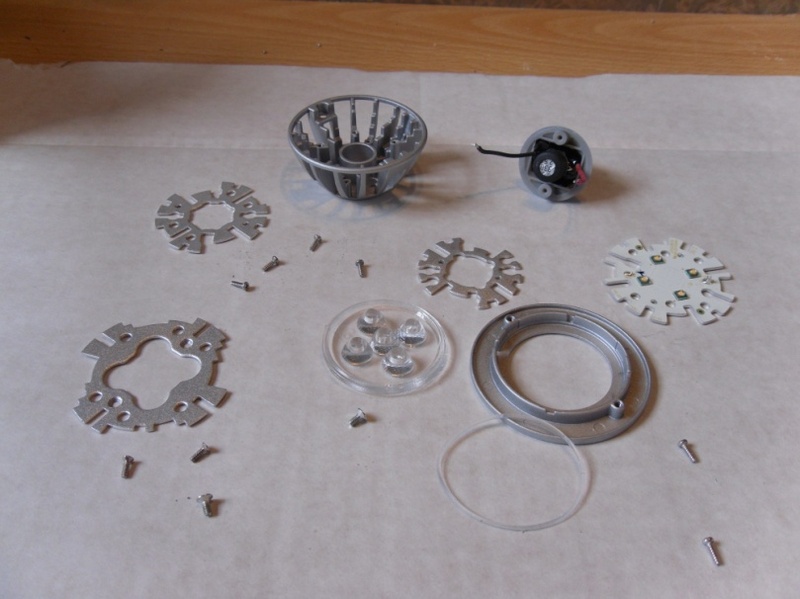 © METECC - Used with permission "We are now offering our most popular light fitted with the latest LED technology. Only uses 5W of energy. 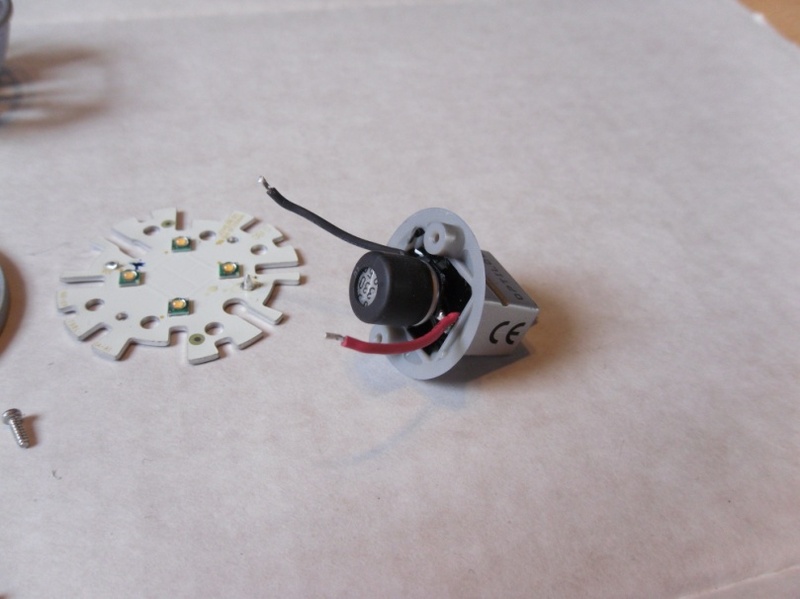 This LED model will interfere with DAB broadcasts." Hardly an incentive to purchase a DAB-killing lamp! The floor standing lamp was fitted with a halogen lamp and powered from the mains. Inside the EMC test-chamber, the lamp was checked for radiated emissions to standardised test EN55022, Class B (domestic usage). 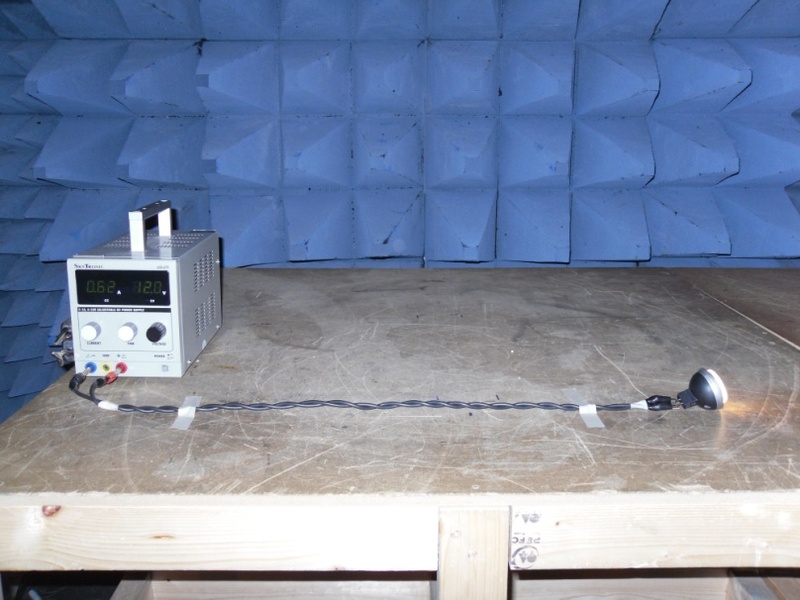 The image below shows the result of the test for radiated emissions from 30MHz up to 1GHz. 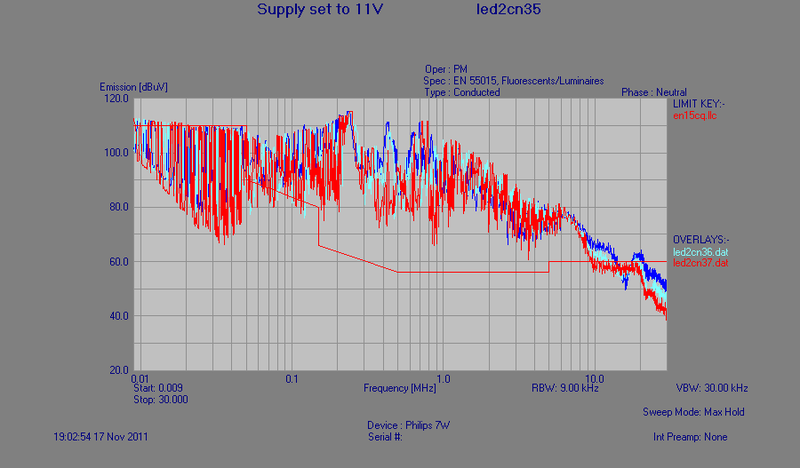 The worst case margin (marker 1) is only 12dB below Class B limits (red line). These emissions were subsequently traced to the 12V switched-mode power-supply. 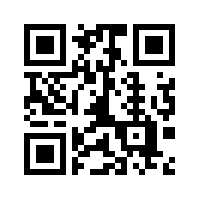 © METECC - Used with permission | Click the image for a larger view. 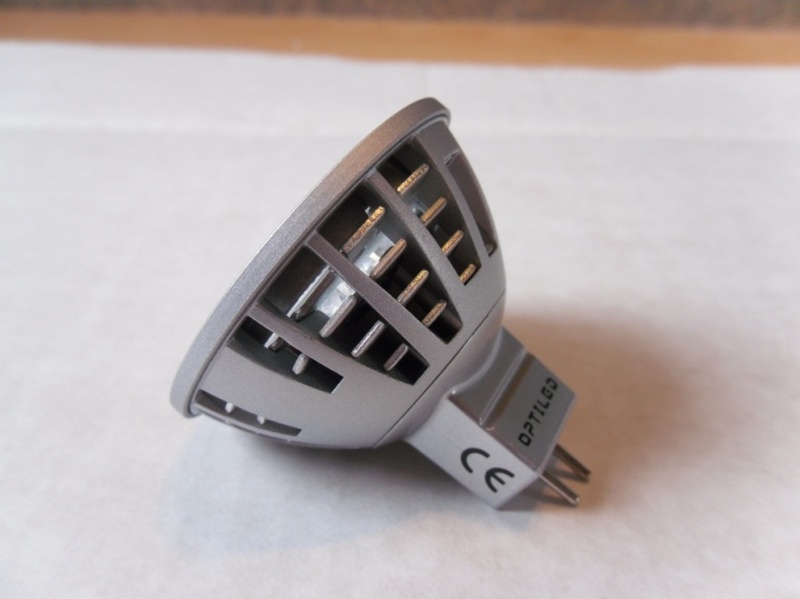 The halogen lamp was replaced with an Opti-LED 3.5W lamp and the radiated emissions were checked again. 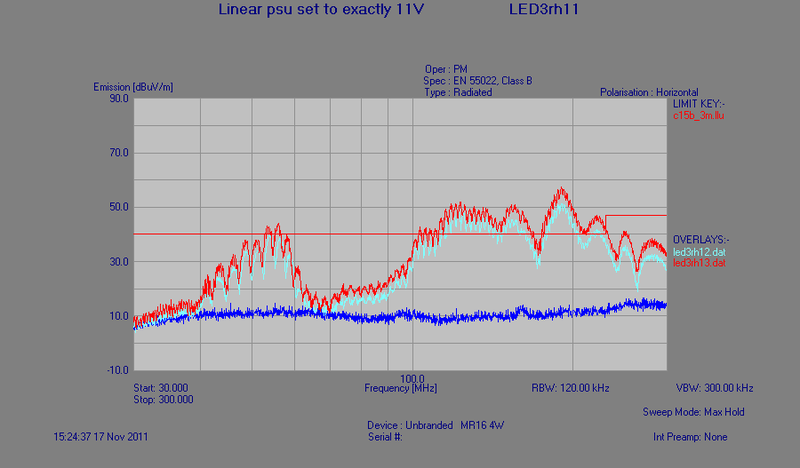 This time, the worst case margin is 15.78dB above the Class B limit (red line). 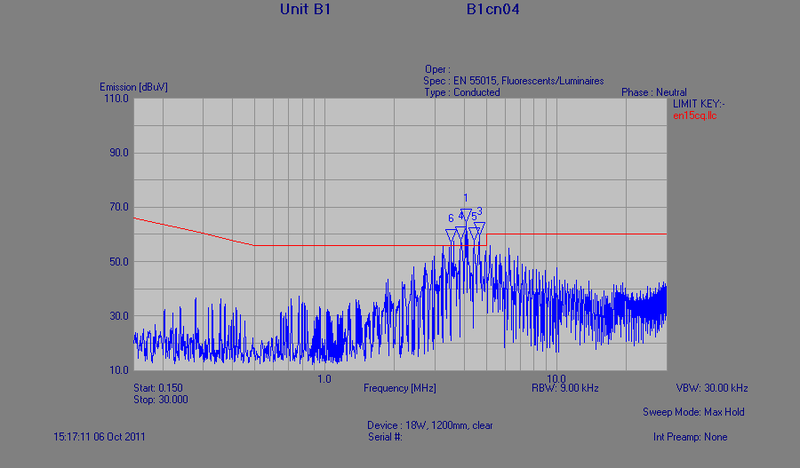 The peaks around 100MHz would cause considerable interference to an 'FM Stereo' radio. 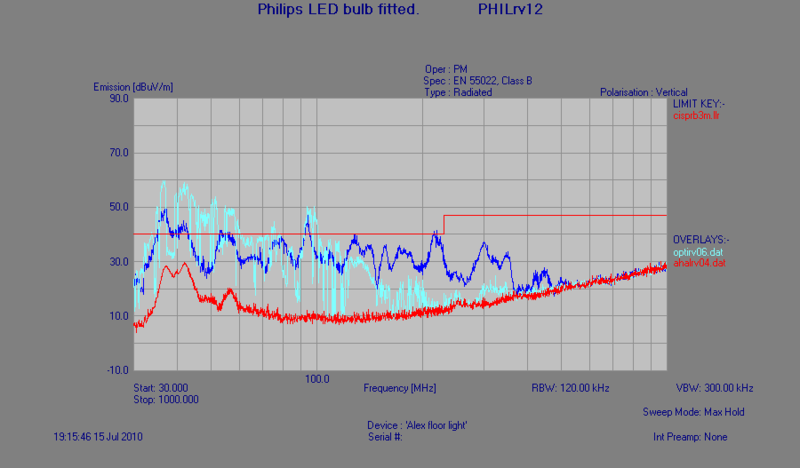 The lamp was replaced with a Philips 7W model and the radiated emissions were tested again. 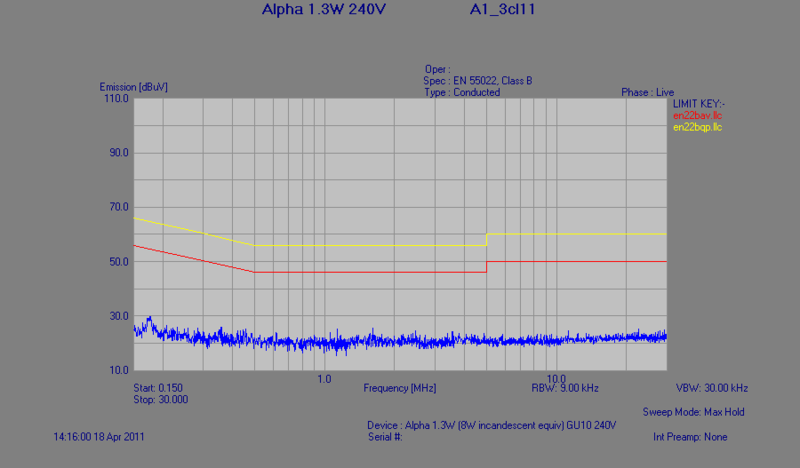 The worst case margin on this test is 7.11dB above the Class B limit (red line). 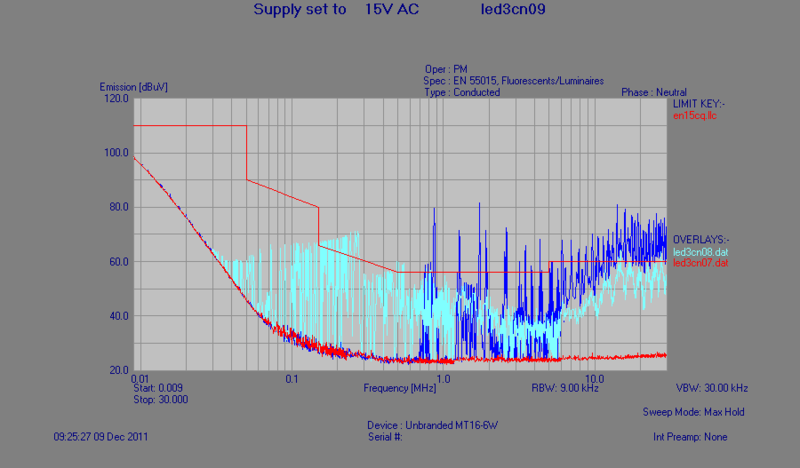 As a quick comparison, the following radiated emissions traces show the halogen lamp (red trace); Opti-LED 3.5W (cyan trace); Philips 7W (blue trace). The halogen lamp was re-fitted and conducted emissions tests were carried out. 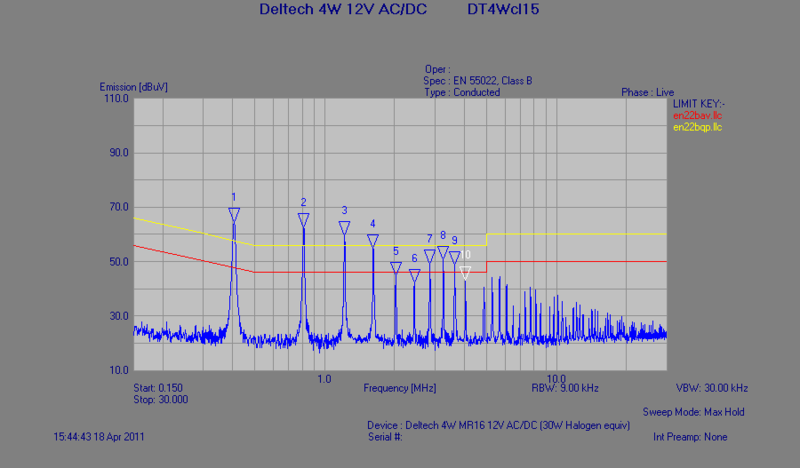 Conducted emissions are typically measured between 150kHz and 30MHz. 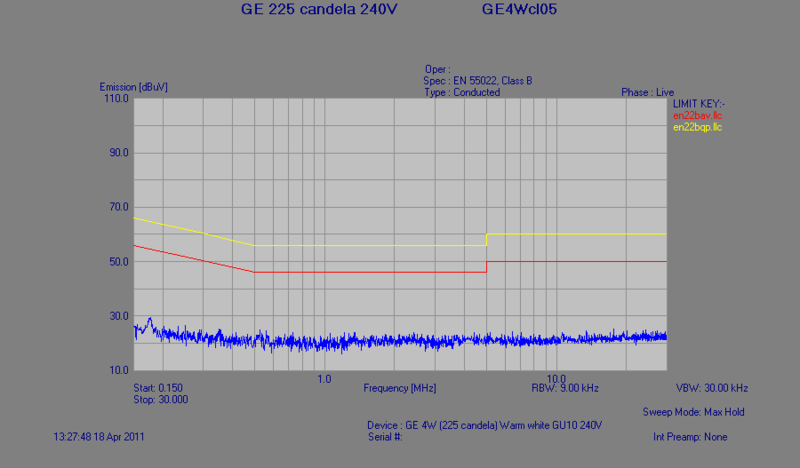 The Average detector was 9.51dB above Class B limits (red line) and the Quasi-Peak detector was 8.54dB above Class B limits (yellow line). The halogen lamp should have been silent. 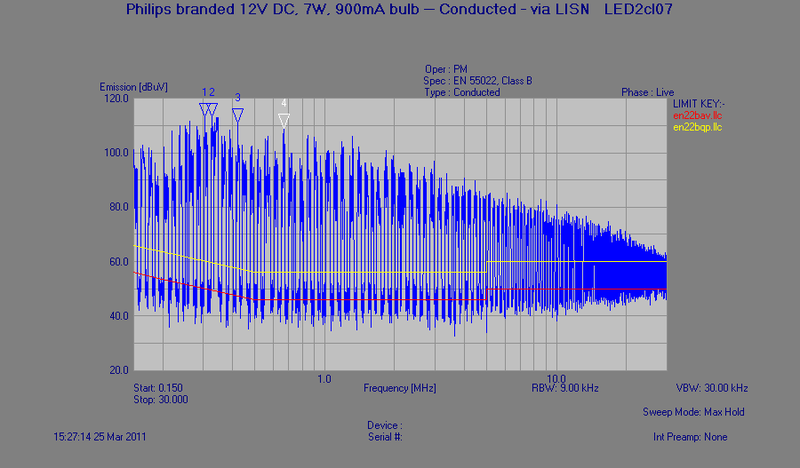 The switched-mode power-supply used in the lamp was clearly non-compliant, but this pales into insignificance when a buck-driven LED lamp was added in to the mix. 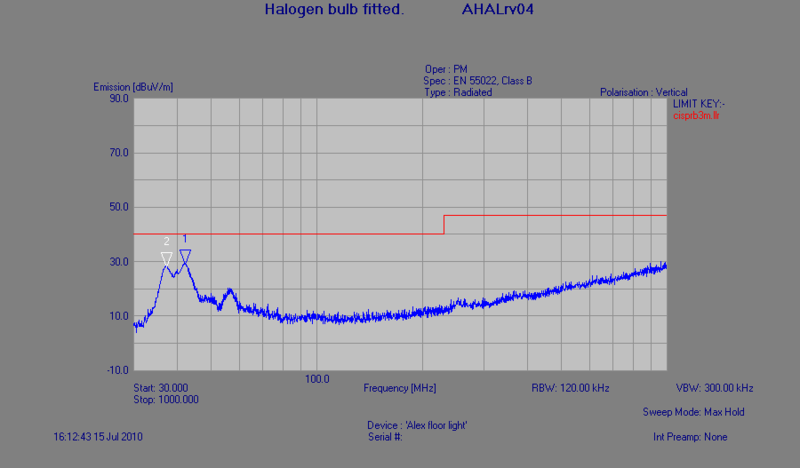 The halogen was swapped for the Opti-LED 3.5W lamp and the conducted emissions tests were repeated. 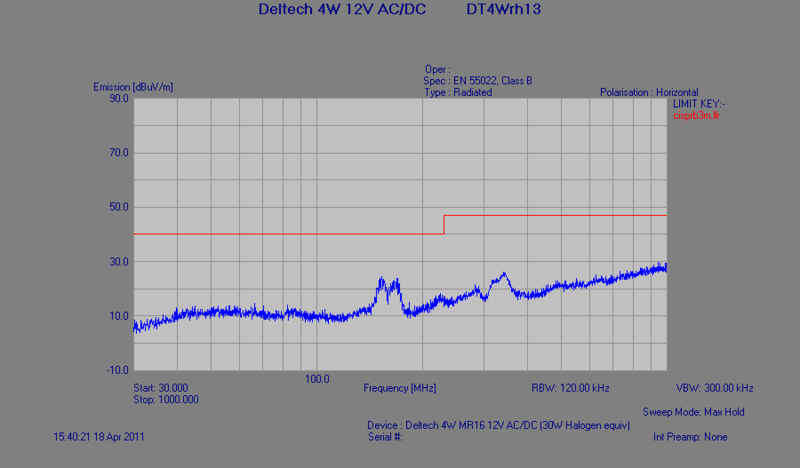 The Average detector was 12.71dB above Class B limits (red line) and the Quasi-Peak detector was 7.57dB above Class B limits (yellow line). 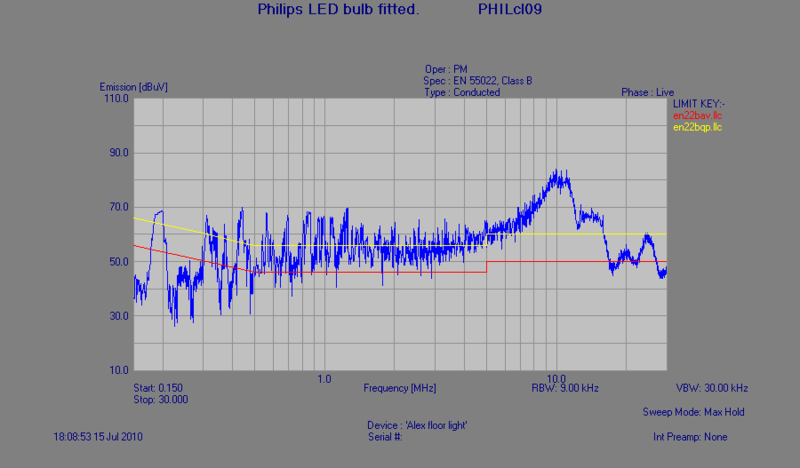 The Opti-LED 3.5W lamp was changed for the Philips 7W lamp and the conducted emissions tests were repeated. 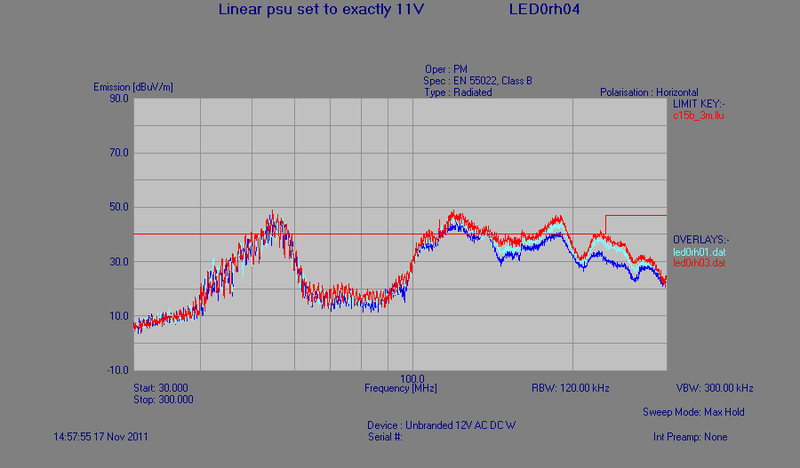 The Average detector was 15.69dB above Class B limits (red line) and the Quasi-Peak detector was 15.12dB above Class B limits (yellow line). 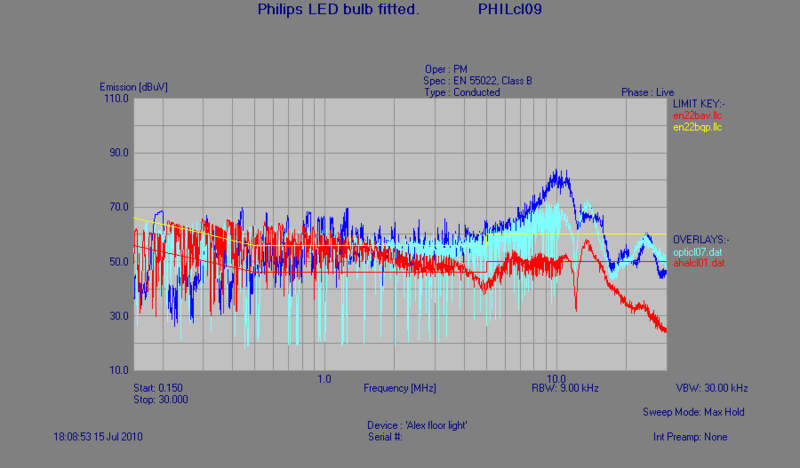 As a quick comparison, the following conducted emissions traces show the halogen lamp (red trace); Opti-LED 3.5W (cyan trace); Philips 7W (blue trace). 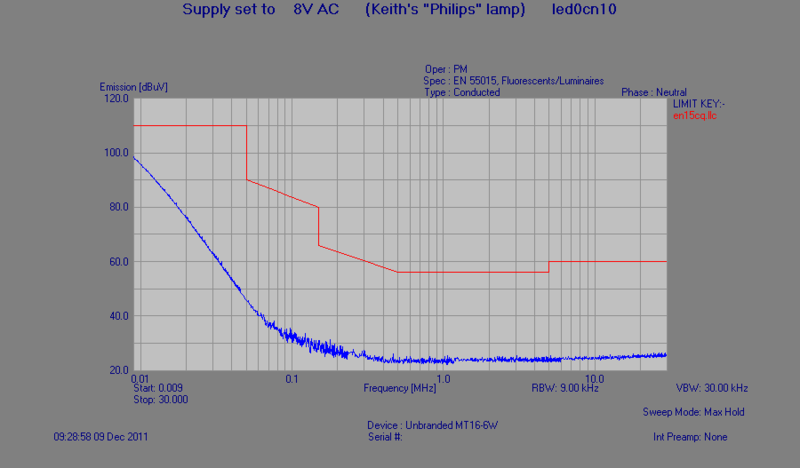 The lower frequency emissions were attributed to the switched-mode power-supply, but note the large variation between lamp types around 10MHz. 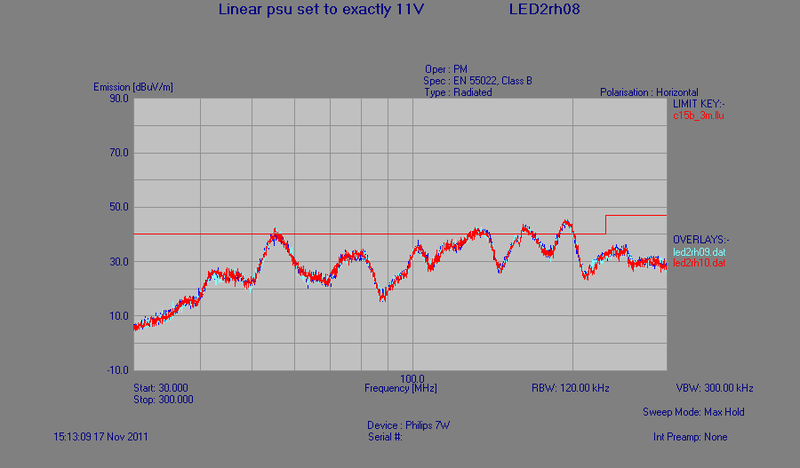 Is this indicative of all LED lighting? We decided to test some battery powered LED lights. 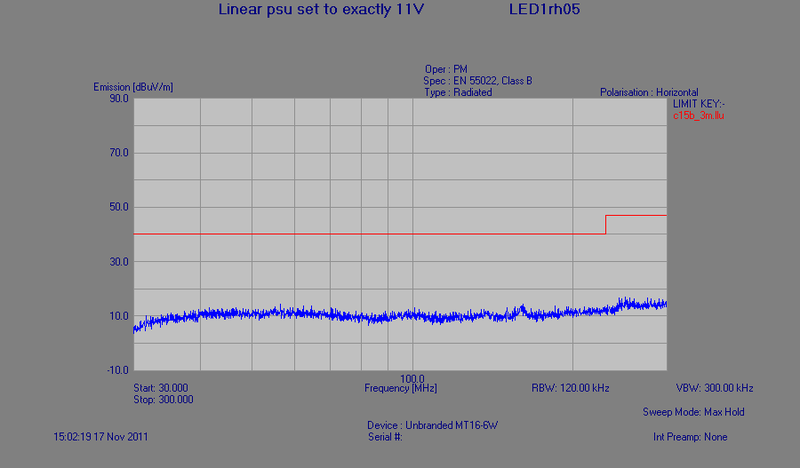 All gave "noise floor" measurements; i.e. they did not create any radiated emissions. 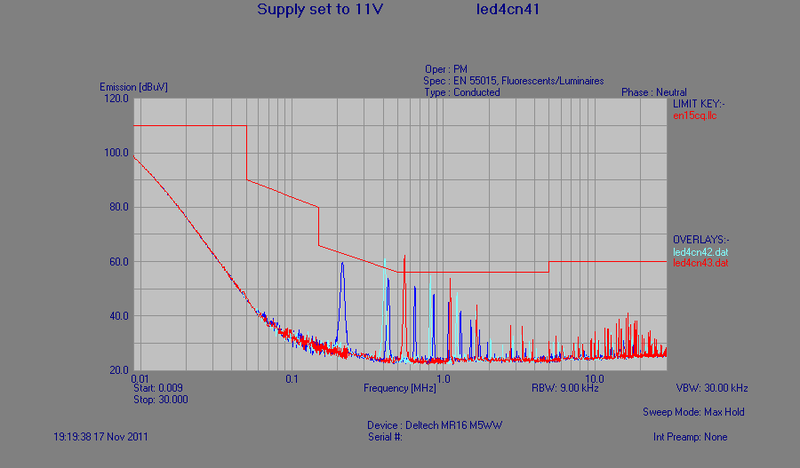 The following radiated emissions traces show the halogen lamp (red trace); Opti-LED 3.5W (cyan trace); Philips 7W (blue trace). Neither LED lamp is particularly clean when compared to the halogen, and both are only just under Class B limits. 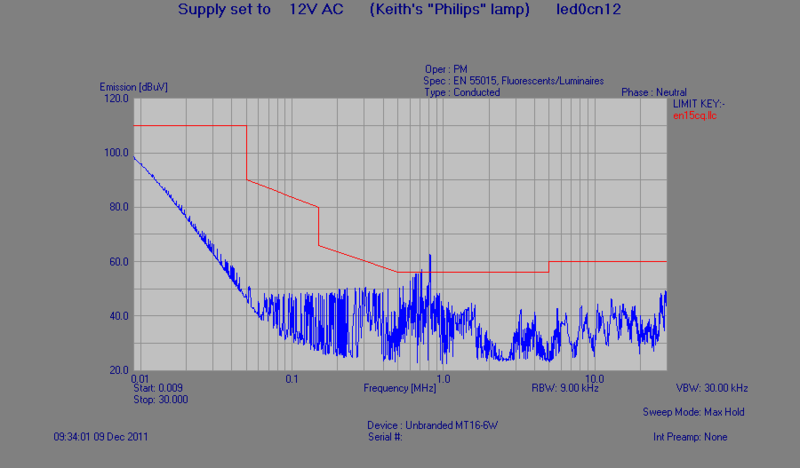 The Philips lamp (blue trace) peaking around 220MHz could cause problems for DAB radios. The following radiated emissions trace shows just the LED plate powered from the linear power supply. The AC/DC converter was left off for this test, and as we can see, only noise-floor emissions are seen. 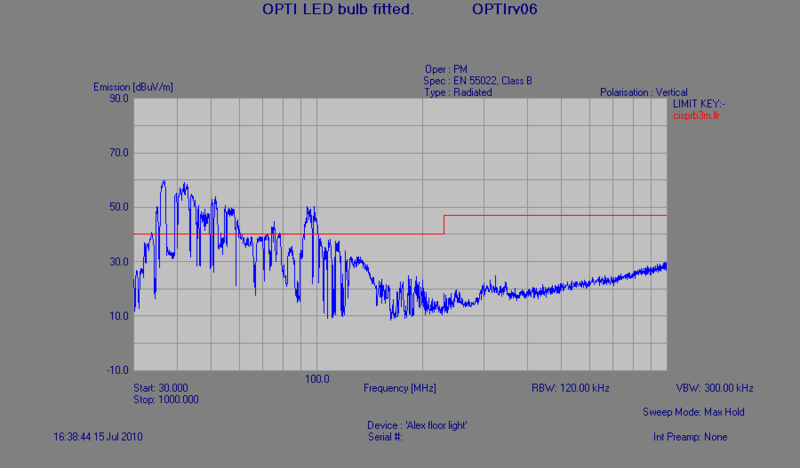 This proves, as we would expect, that the diodes do not create any detectable noise. 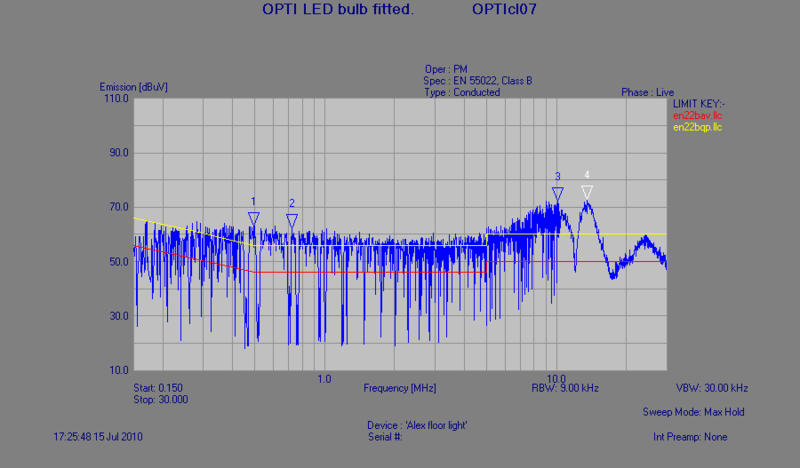 The following conducted emissions trace is for the Opti-LED 3.5W lamp fed with 12Vdc via a Line Impedance Stabilization Network (LISN). 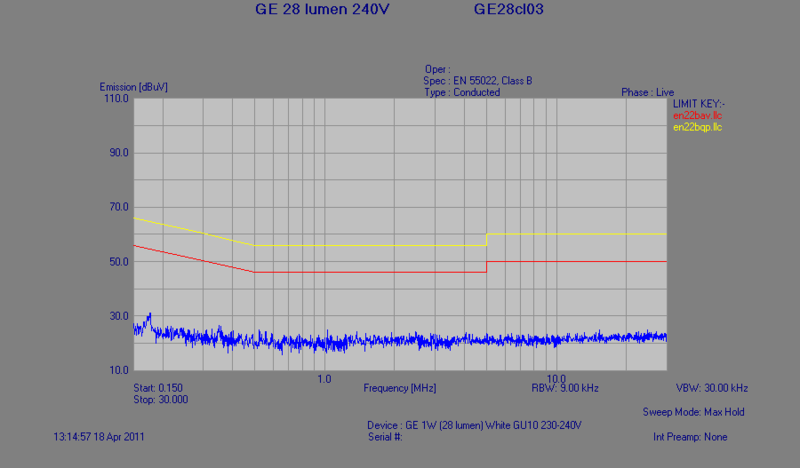 The Average detector was 30.83dB above Class B limits (red line) and the Quasi-Peak detector was 20.30dB above Class B limits (yellow line). 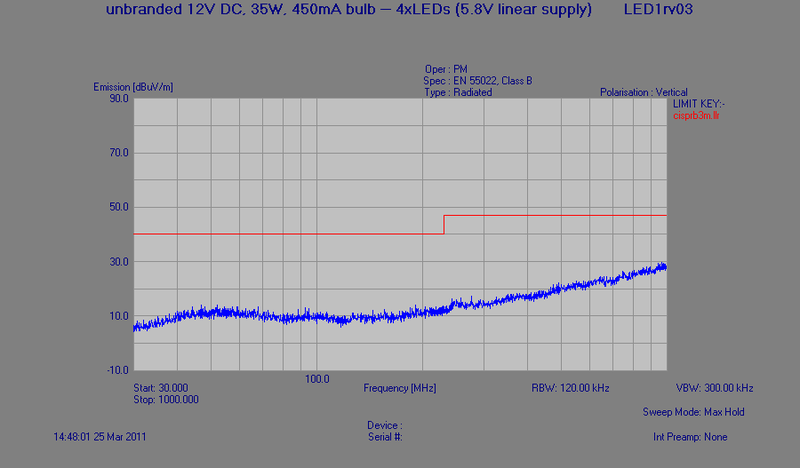 These emissions are clearly generated by a buck-driver constant-current device used to regulate current to the LEDs. 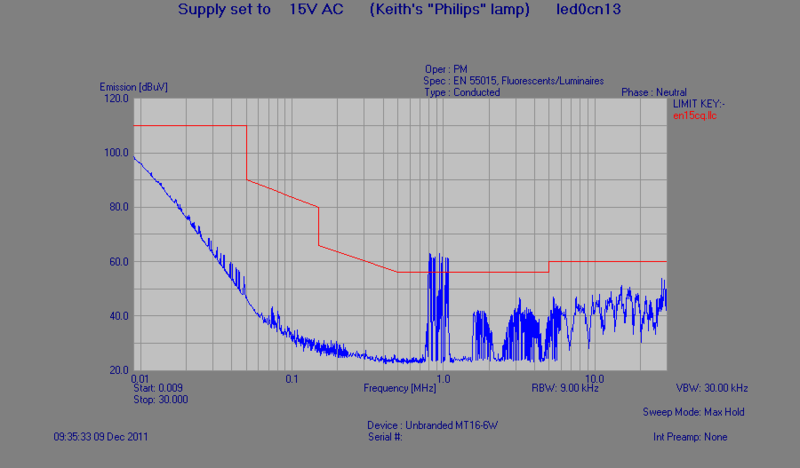 The following conducted emissions trace is for the Philips 7W lamp fed with 12Vdc via a LISN. 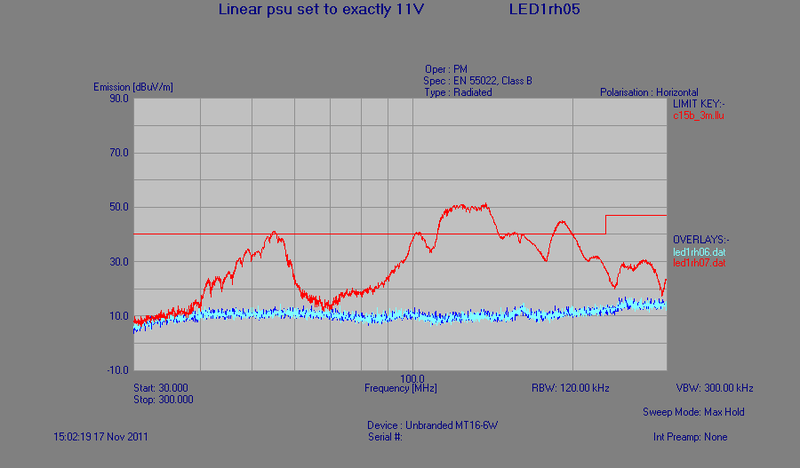 The Average detector was 57.74dB above Class B limits (red line) and the Quasi-Peak detector was 61.64dB above Class B limits (yellow line). 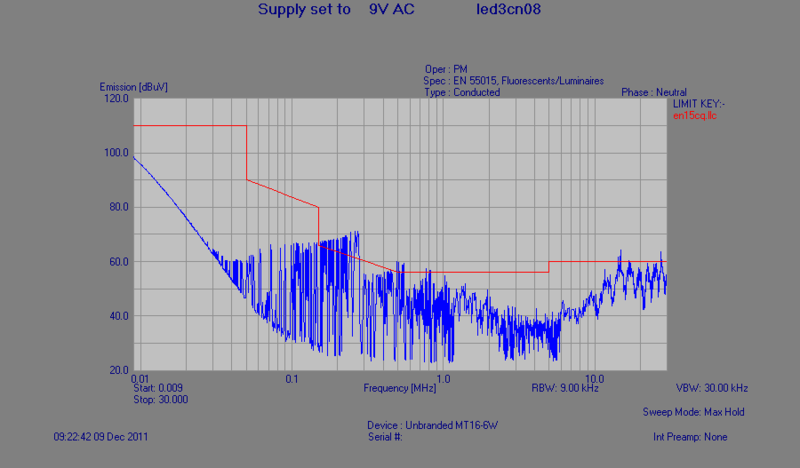 Note: Overload of the test equipment was detected, so linearity of readings could not be guaranteed. We decided to purchase and test other lighting solutions, including mains-powered lamps (where they might include their own power-regulator). 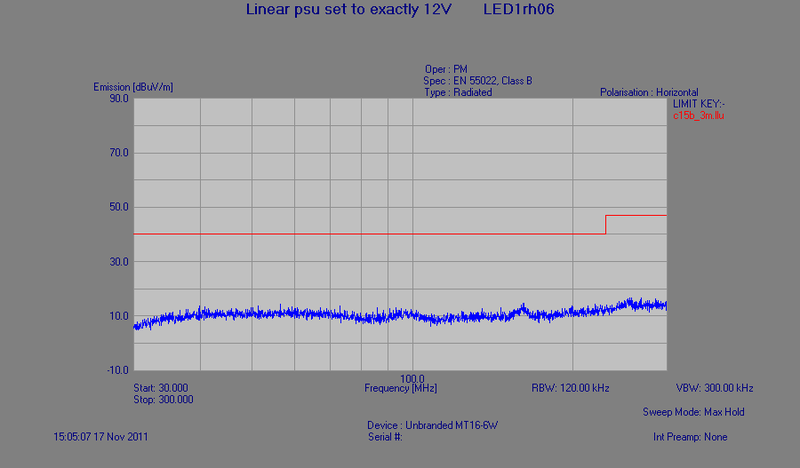 This unit FAILS the conducted Quasi-Peak requirement by 7.37dB (marker #1). 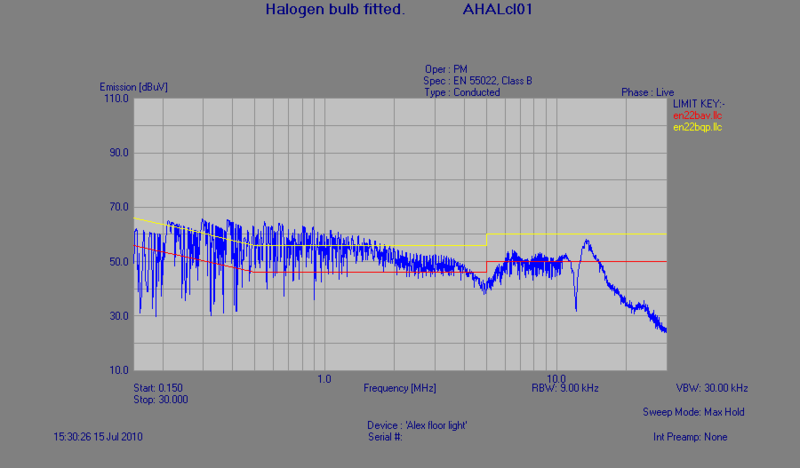 9-150kHz conducted, and 30-300MHz radiated emissions, are all well within requirements. 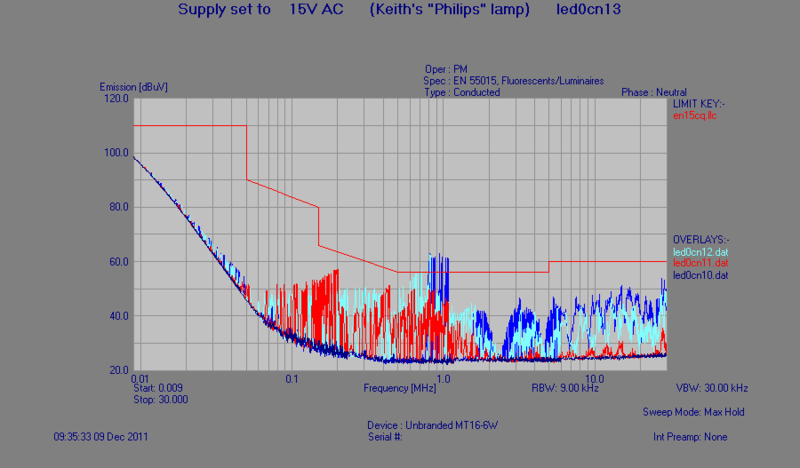 Tim Williams (of Elmac Services) has been carrying out independent investigations on 240Vac lamps and has found all to be compliant for conducted emissions, but have quite different characteristics, especially below 150kHz. We, along with Keith Armstrong (of Cherry Clough Consultants), are concerned that we may have a misunderstanding of the EMC Standards and Regulations as lamp manufacturers appear to be under the misapprehension that only conducted emissions testing is required, and then only for 230/240Vac units. We were recently informed by a company, who install studio equipment, that many professional recording studios have banned the use of "energy efficient" lighting, in particular LED lighting! 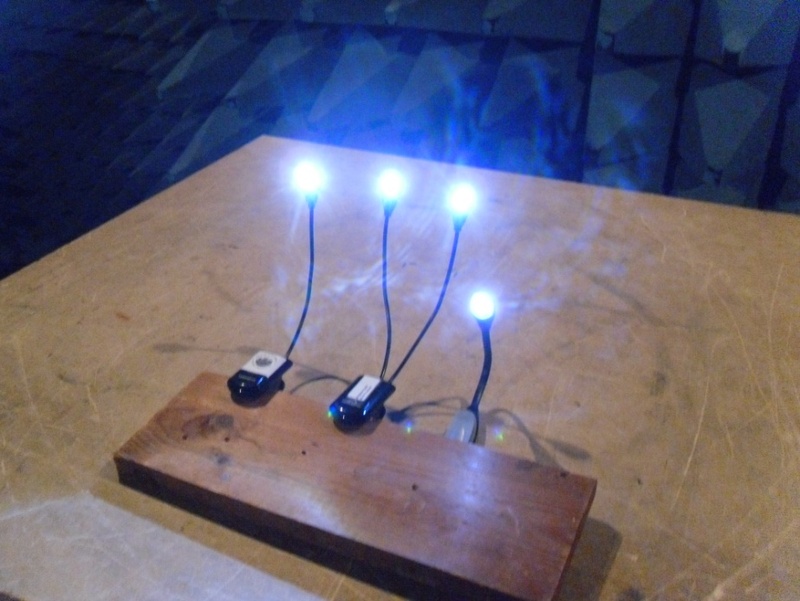 The LEDs themselves are, as expected, benign and do not emit. 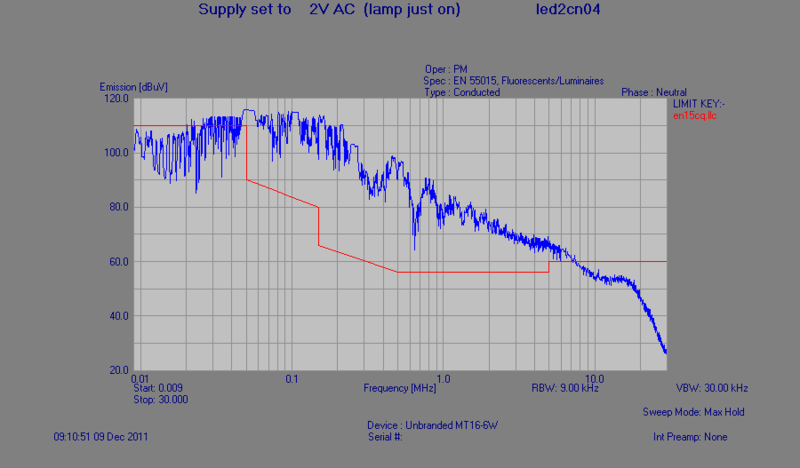 Available 240Vac units appear to be compliant (at least above 150kHz). If 240Vac lamps do employ switching circuitry then the technology and/or filtering used appears to be adequate for compliance. 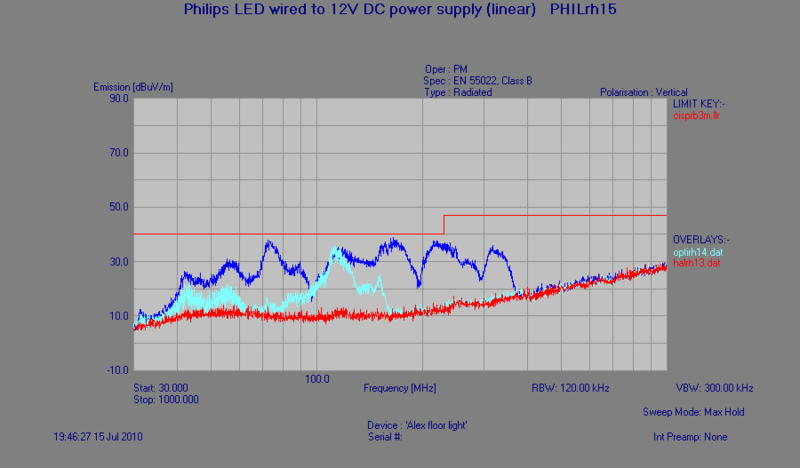 Low voltage units employing LEDs only (torches, panel indicators, etc.) are no problem. Even some low voltage units employing switching circuitry are no problem. 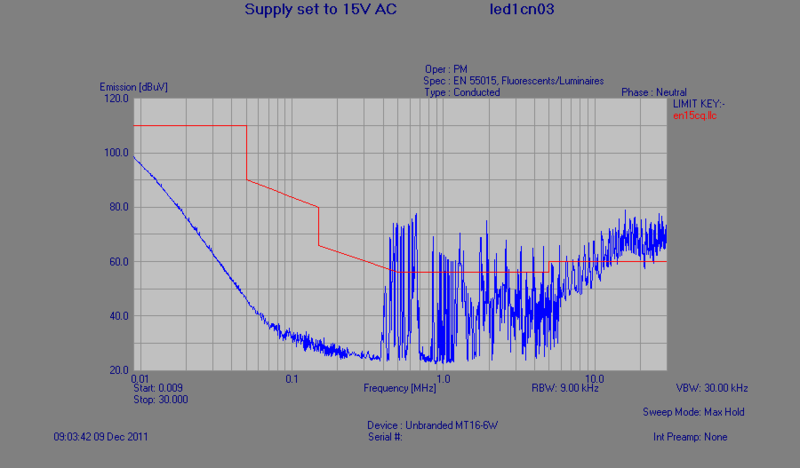 Some low voltage LED units employing electronic devices (constant current sourcing?) exhibit unacceptable conducted emissions. The current trend towards "energy efficient" lighting means that LED usage will become much more widespread. These units are often installed as part of a low voltage distribution system which could extend over an entire building. 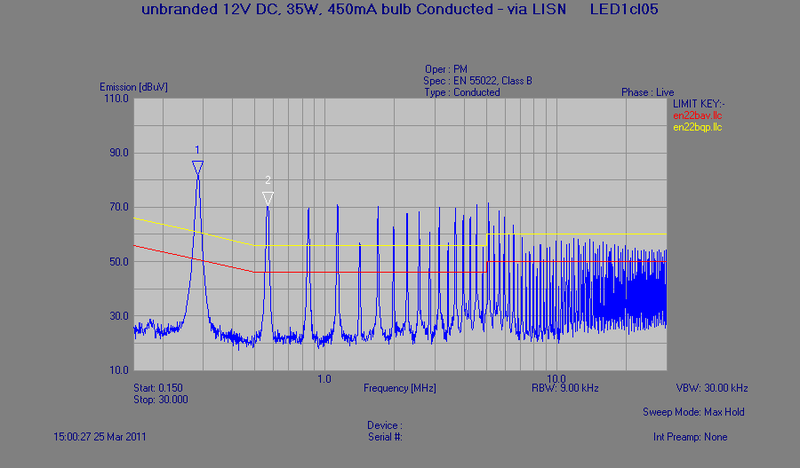 Reports seem to show that the lighting industry does not appreciate the need for low voltage device emissions testing. 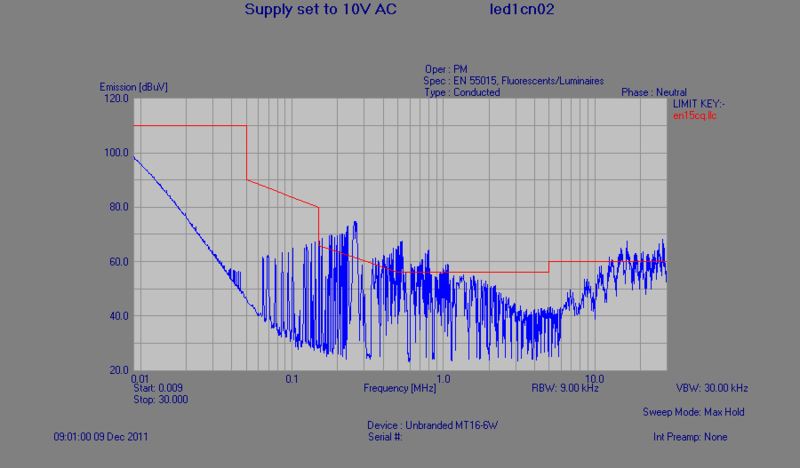 Research into better ac/dc converters and constant current devices, along with adequate filtering, is essential. Problems are beginning to emerge in areas other than domestic lighting. What will be the impact on the power distribution network, and the radio spectrum when you consider how many LED lights a household may have? We were demonstrating these findings at the EMCUK trade show in October 2011 when we suddenly found one of our lamps, which was previously thought to have few emissions, suddenly went way above the limit! Tracing the problem we noticed that the voltage supply to the lamp had drifted off 12V. This led us to a whole new line of investigation, and by now, other people, including Keith Armstrong, had lent us more LED lamps to look at. No radiated emissions problems at exactly 12V. 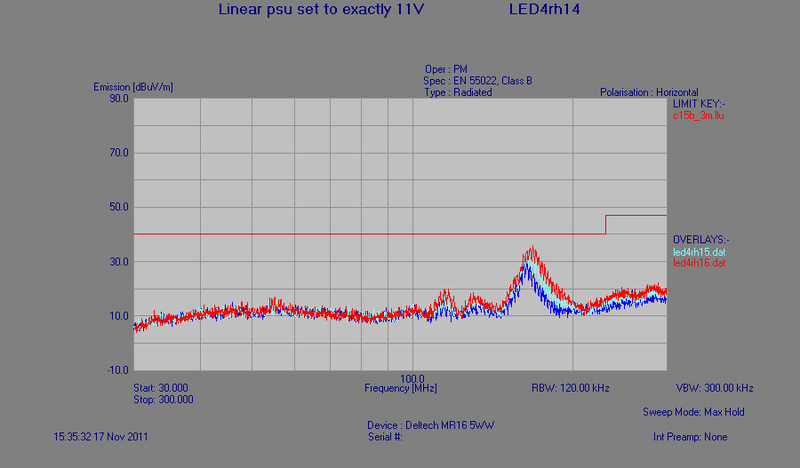 Radiated emissions "slightly" above the limit with the voltage set to exactly 13V. 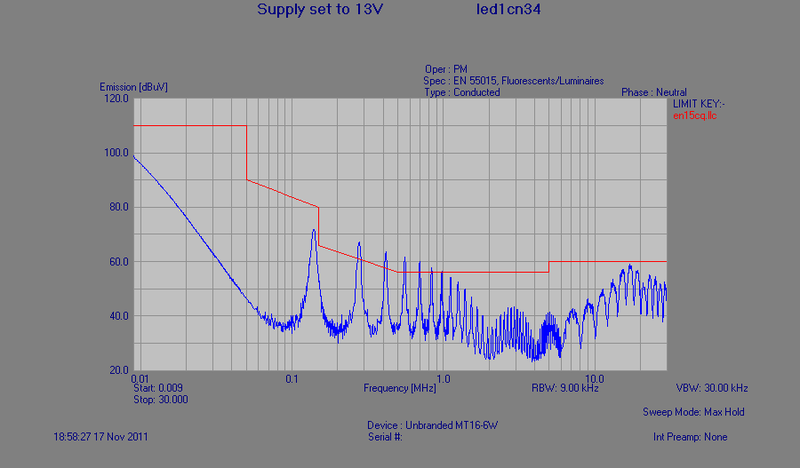 Radiated emissions with comparison overlays for voltages at 11V (blue trace), 12V (cyan trace) and 13V (red trace). 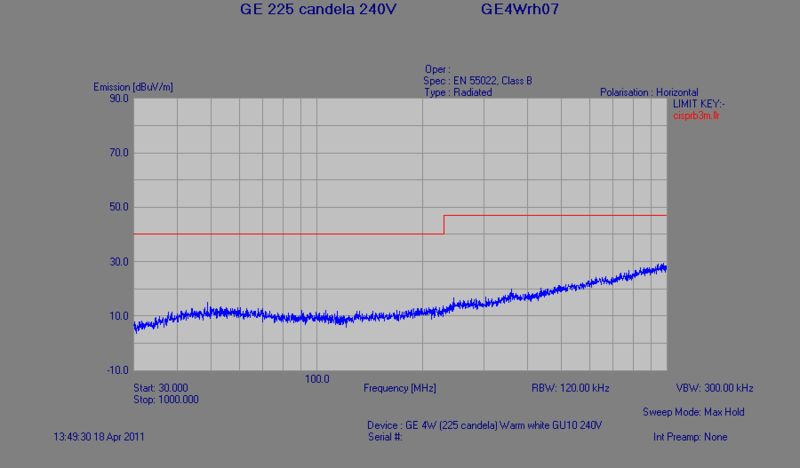 Conducted emissions at 13V - not quite noise floor! 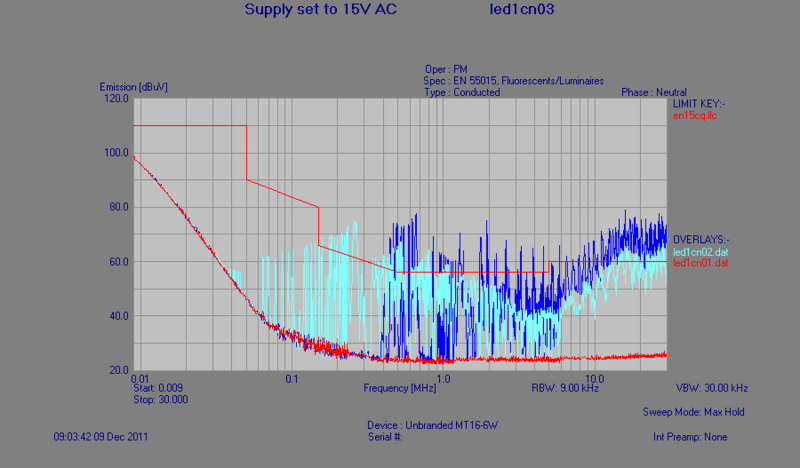 Conducted emissions with comparison overlays for voltages at 11V (blue trace), 12V (cyan trace) and 13V (red trace). 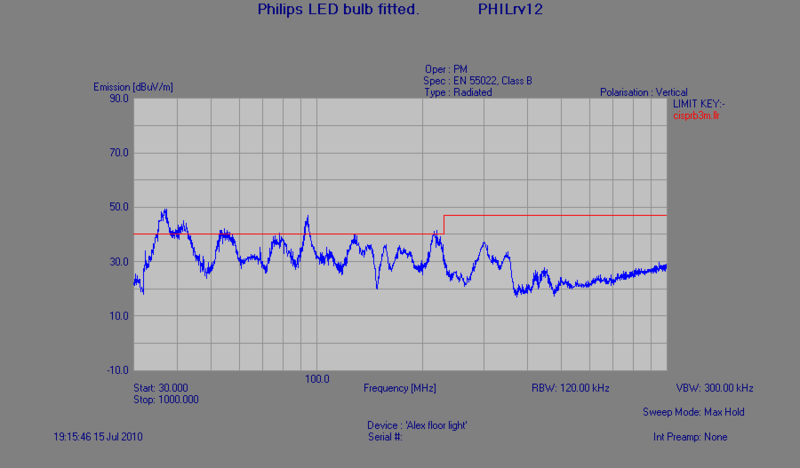 Not all LED lamps exhibit this poor behaviour - some are poor at all voltages. The critical voltage is not always the same! 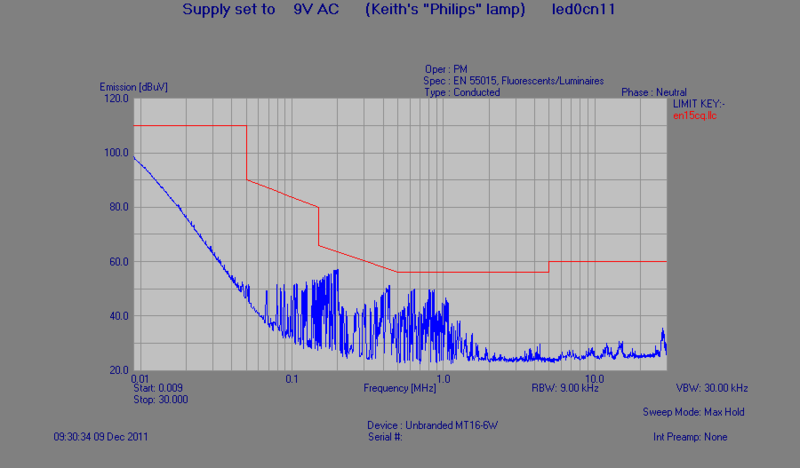 Does using AC voltages make a difference? 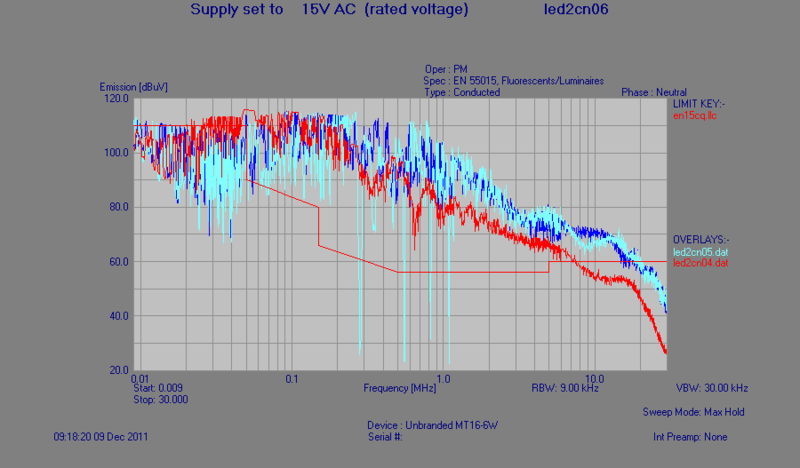 Conducted emissions with comparison overlays for voltages at 9Vac (red trace), 10Vac (cyan trace) and 15Vac (blue trace). Conducted emissions with comparison overlays for voltages at 2Vac (red trace), 12Vac (cyan trace) and 15Vac (blue trace). 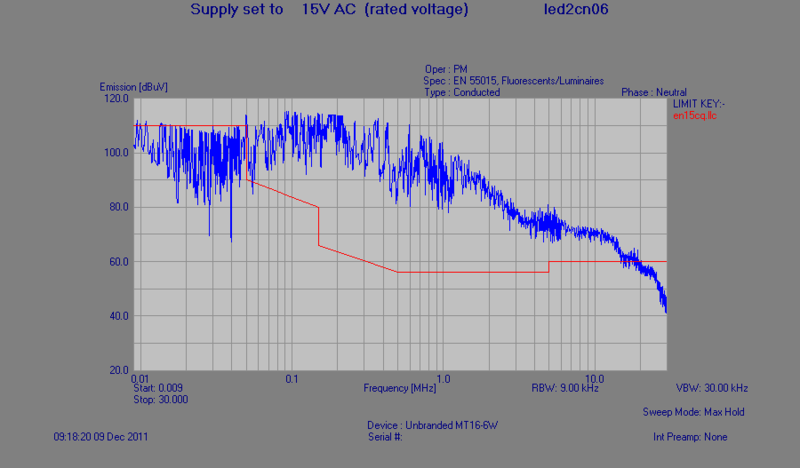 Conducted emissions with comparison overlays for voltages at 8Vac (red trace), 9Vac (cyan trace) and 15Vac (blue trace). 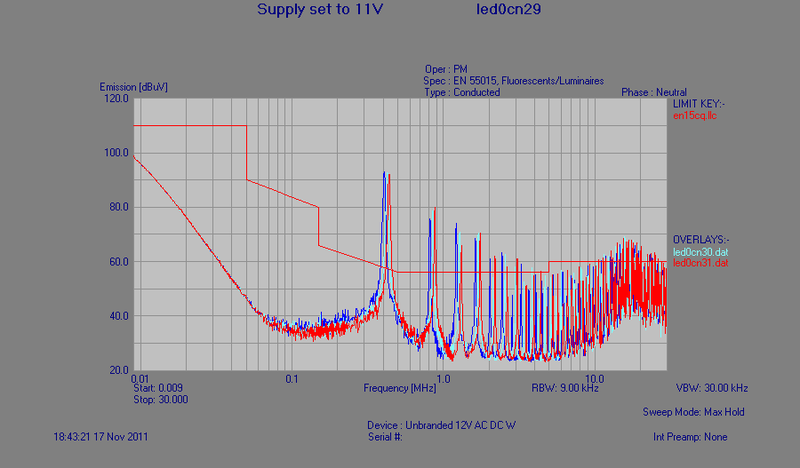 Conducted emissions with comparison overlays for voltages at 8Vac (black trace - noise-floor), 9Vac (red trace), 12Vac (cyan trace), and 15Vac (blue trace). 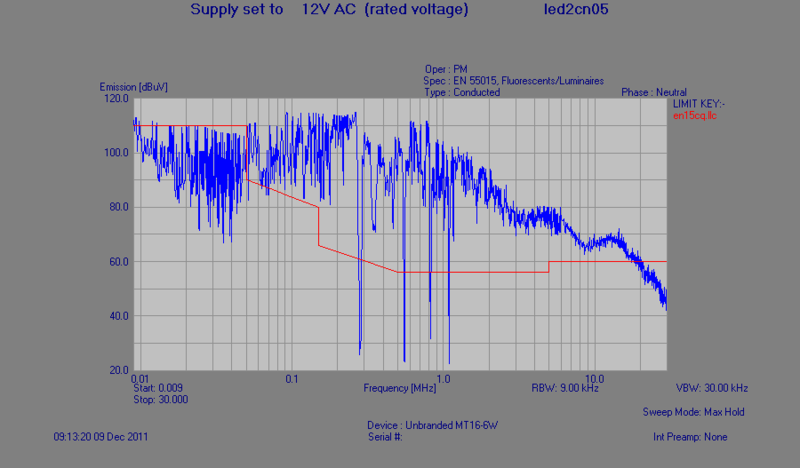 METECC appreciate that the limit lines shown on some of the graphs are not strictly correct (CISPR22/EN55022 was used instead of CISPR15/EN55015) but it does not detract from the underlying problem of a lack of compliance to established EMC standards. The purchaser of CE-marked, non-EMC-compliant devices, appears to have no recourse to the law whilst the body in charge of enforcing EMC compliance (Ofcom) continues to ignore their statutory duties.